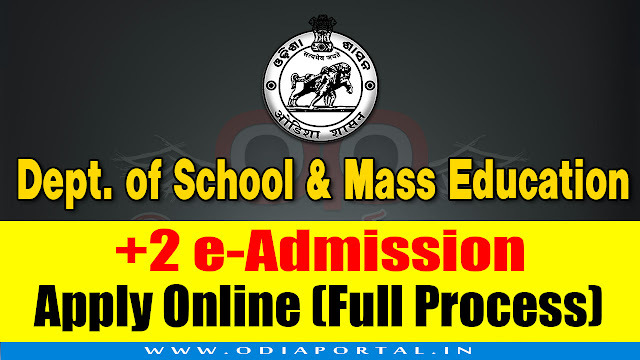 Department of Higher Education (DHE), Odisha 2018-19 +2 e-Admission to Junior Colleges Application form now available online. If you are going to apply for +2 e-Admission then you have to read the process of Online apply and procedure. Click the button to Apply Online Now for Free. Click on the above button., Wait for the page to load completely. Upload your Passport Size photo. Click on Drop down menu to select your Exam. Board Name. Enter your Matric Roll Number & wait for a while to let the page to load your Name & Result list. Enter your Father & Mother's Name. Then, Go to Address field. Your State Name, District name, Block name, Village/Post office details with PIN Code. Then go to reservation Details field. Select your Reservation Buttons. SC/ST/OBC/GEN etc. PH/OH, CoM, ESM, SDP, etc Carefully read and select. Then Select if you have NCC or Other Sports Certificate. NEXT SECTION: Details of Mark Secured in 10th Examination. It will auto select through your Roll Number. Mark list also. Here comes IMPORTANT option. Choose college(s). There are total "06" options for college selection. College Selection Method: First Choose College Type & Then District Name & wait for a while to load College List of the District. Then check the list and select your 1st College Name. Then stream. (Arts/Sc/Com). Then Compulsory Subject (MIL) . Then Select 3 Elective Subjects One by One. Now select the Elective subject. Then if you are interested to reside in Hostel. YES/NO. After completing of 1st College Selection Process, then 2nd, 3rd, 4th ans so on. Read the whole Page carefully, Then click on SUBMIT. After Getting Registration Confirmation page stating the Reference Number, you can now Click on "Print Applicant & College Copy". REMEMBER: Enable your Web Browser Pop-up option to print the application copy. If you are getting any error or not able to apply, Please contact us through the Comment Box below.